Disclosure: I was sent a sample from the vendor in order to review. However, all views shared are mine and mine alone. If you have young children, then you probably know about Paw Patrol. My oldest daughter, Savannah, has been a fan of Paw Patrol since this popular animated series on Nickelodeon began. And, she shows off her love of these cute pups each and every day, with the licensed Paw Patrol clothing she wears out and about and to bed, or when she is toting around one of countless toys or plush, from her evergrowing Paw Patrol toy collection. A couple weeks ago we celebrated Savannah's 6th b-day, and she was so excited to find many of her friends gave her Paw Patrol gifts, as they, too, know just how much she loves Paw Patrol. And, when the party was over, Savannah and a handful of her friends headed back to our house to watch the upcoming Paw Patrol: Sports Day! DVD which we arrived earlier in the day in the mail to review. What a great ending to a perfect birthday she said, as she and all her friends were all smiles watching this upcoming DVD release. 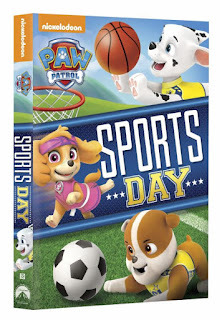 "The PAW Patrol pups know how to mix fun and responsibility in this new DVD, PAW Patrol: Sports Day! available on August 2! Everyone's favorite rescue pups are back in action in six exciting, sports-themed adventures and rescues. This DVD contains many adventures, including Ryder and Marshall forming a basketball team to help Mayor Goodway, Everest snowboarding to make a daring rescue and the Pups using their brand-new Air Patroller to find friends in need. There's no denying the Pups know how to be brave and have fun! Produced by Nickelodeon Home Entertainment and distributed by Paramount Home Media Distribution, PAW Patrol: Sports Day! joins the rest of the PAW Patrol releases as the hottest preschool TV DVD franchise on the market, and will be available on DVD August 2 for the suggested retail price of $14.99. Nickelodeon, now in its 37th year, is the number-one entertainment brand for kids. It has built a diverse, global business by putting kids first in everything it does. The company includes television programming and production in the United States and around the world, plus consumer products, online, recreation, books and feature films. Nickelodeon's U.S. television network is seen in more than 90 million households and has been the number-one-rated basic cable network for 20 consecutive years. For more information or artwork, visit http://www.nickpress.com. Nickelodeon and all related titles, characters and logos are trademarks of Viacom Inc. (NASDAQ: VIA, VIAB). My little cousins love this show! Especially the police dog.